When considering your financial future, there are many issues you’ll want to consider. This guide will help walk you through these issues. This guide is relevant to Oregon Public Universities’ employees and OSU Clinical Interns. Students are not eligible. The TDI Guide is intended to assist in the administration of the plan, and it includes a summary of common TDI Plan provisions. To obtain additional information about the Plan, talk to your university benefits office for specific assistance or view the official plan document here. In the case of conflict between this guide and the official plan documents of the TDI and Oregon state law, the official plan documents, Oregon state law, and federal regulations will govern. The Tax-Deferred Investment 403(b) Plan (TDI) allows you, on a voluntary basis, to accumulate savings to support your employer retirement plan (OPSRP/PERS or the Optional Retirement Plan (ORP)) and Social Security through your choice of annuities and mutual funds. Authority to offer the TDI is granted by the state of Oregon under ORS 243.820-.830 and Section 403(b) of the Internal Revenue Code. Most Oregon Public University employees and OSU clinical interns are eligible to participate in the TDI plan. This includes full- and part-time employees. Student employees may not participate in this plan. Employees who are nonresident aliens who receive no earned income from sources within the U.S. are not eligible. This TDI Guide is a general overview of the Tax-Deferred Investment 403(b) Plan. It is not intended to be an exhaustive study of investments, nor does it provide investment or tax advice. The TDI Guide does not recommend that you participate in the TDI plan. The decision to participate and selection of investment vehicles belongs to each participant, based on factors personal to the participant. In case of conflict between the TDI Guide, official plan documents, and federal state laws regulating IRC 403(b) plans, the official plan documents and laws govern. The TDI Guide describes the Tax-Deferred Investment 403(b) Plan in general terms applicable to IRC 403(b) plans, and provides basic information you need to participate in the TDI. This TDI Guide relies on Treasury and IRS regulations, but does not outline all of the requirements of these regulations. Oregon Public Universities Retirement Plans are not responsible for points not covered. Oregon Public Universities Retirement Plans maintain the right to amend or discontinue the Tax-Deferred Investment 403(b) Plan to comply with regulations or changes in the law or policy or to improve performance or operation of the plan. For employees hired before July 1, 2014, Oregon Public Universities Retirement Plans are not responsible in any way for an employee’s choice to participate in the plan or an employee’s choices once in the plan. Employees hired on or after July 1, 2014 as academic or administrative faculty eligible to participate in the Optional Retirement Plan (ORP) are responsible to consider participating in the TDI plan in order to receive a Tier Four ORP Employer Match. See the TDI Match in ORP Tier Four Supplement. If you have additional questions about the Tax-Deferred Investment 403(b) Plan, contact your campus benefits office. For information on investments or tax implications of participating in the TDI plan, consult a financial or tax advisor. Most university employees and OSU Clinical Interns. Students are not eligible. None. Eligible employees may enroll any time. Enroll prior to 10th day of the month contributions begin. Permitted any month of the year. Both a Salary Reduction Agreement (SRA) form and TDI provider’s application are required to complete enrollment. Enrollment is restricted to one provider/program at a time. Contribution, as a percent of pay, may be changed throughout the year. SRA must be received by 10th of change month. Provider/program may be changed once per calendar year. A “0%” SRA must be received by 10th of month to terminate contributions. Voluntary salary deferral, non-taxable as income in the year deferred. Not reported as W-2 wages, except for FUTA, Medicare, Social Security. Taxed as ordinary income when account distribution received. Earnings plus contributions taxable to participant when distributed. Taxed as ordinary income when contributed. Earnings are not taxed when received as a qualified distribution. Not reduced by TDI contributions. ORP participants hired on or after July 1, 2014 receive a matching contribution to the ORP, equal to the percent of salary (up to 4%) that is contributed to the TDI voluntary plan. TDI funds may be used to restore previously forfeited creditable service time or purchase retirement credit in PERS. Additional information on this process is available from PERS. At least $25.00 per month, as a whole percent of pay (1%, 2%, etc.). Allowed at service separation, death, or age 59 ½. 10% early withdrawal penalty before age 59 ½ or age 55 retirement. Minimum distribution required after age 70 ½ or post-70 ½ retirement. Loans are allowed in the TDI plans, up to an aggregated limit for all plans and dependent on provider guidelines. As of September 1, 2016, participants may only have two (2) outstanding loans out at any given time. Participants will be ineligible for another loan until they have only one (1) outstanding loan remaining. In the event of a loan default, the participant will be ineligible for a new loan until the defaulted loan is paid in full. Withdrawals are permitted for specific IRS safe harbor hardship purposes. Withdrawals permitted after age 59 ½. Permitted from and to PERS, qualified IRAs, 401(a), 403(b), and 457 plans, subject to approval of receiving plans. Transfers from discontinued TDI companies are permitted to the TDI with currently active plan sponsors (TIAA, Fidelity, VALIC – if eligible). No transfers or contract exchanges are permitted to discontinued TDI companies. Oregon Public Universities’ role in the TDI plan is to send your payroll deduction contribution to a provider approved for participation in the Tax-Deferred Investment 403(b) Plan. Deduct monies from your paycheck, based on your Salary Reduction Agreement (SRA) instructions. Forward your contribution to the TDI provider/program you designate. Select providers to provide administration services and a choice of investments. Provide plan forms, documents, employee guides, and direct access to providers’ services. Select and monitor core investments available in the TDI program. Approve loans, hardship withdrawals and other distribution requests as received from Providers. Match TDI contributions up to 4% of pay for ORP Tier Four Participants. Recommending participation in the TDI plan, except to explain that ORP Tier Four Participants receive a TDI-matching contribution to the ORP. Advising employees about investments or the tax consequences of their investing decisions. Decide whether to participate in the TDI Plan. Decide which investment options to use, and how much to invest. Research and understand the provisions of investments you select. Understand the tax implication of investing through this Plan. Correctly execute enrollment and change procedures. Request loans, hardship withdrawals, and other distributions from Providers. Ensure that your contributions are limited so as not to cause a maximum limits violation if you have contributed to other outside 403(b) or 401(k) plans. Contributions to those plans must be combined with our 403(b) plan in applying the limits. It is your responsibility to monitor these limits, and if you do exceed them, you will have to request a return of the excess from the outside plan. TDI Providers approved to offer investments through the TDI plan agree to abide by guidelines on campus solicitation, errors and omissions insurance of agents representing them, and compliance with federal and state regulations applicable to IRC 403(b) plans. 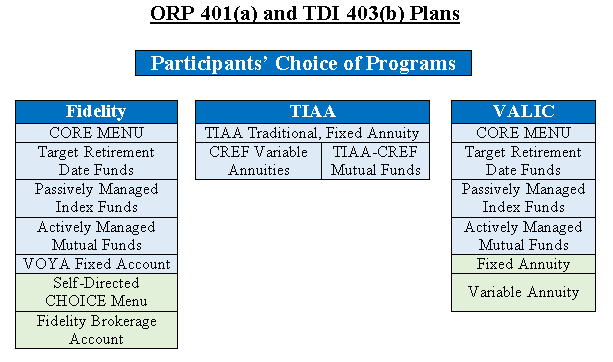 The TDI Plan offers, generally, the features of a 403(b) plan, as described below. Where the TDI Guide varies from Internal Revenue Code, state and federal tax laws, participant contracts, or plan documents, these documents prevail. Provisions noted in this guide are subject to change to comply with law and as directed by the Oregon State Board of Higher Education. Oregon Public Universities Retirement Plans cannot advise you about the tax treatment of your TDI account. This guide states only general rules, and tax rules are subject to periodic changes. For reliable tax information you should consult your tax advisor. The income you contribute as TDI contributions is subject to Social Security and Medicare taxes (FICA). Those taxes are withheld on your full compensation, before your payroll deduction to the TDI Plan is made. Therefore, participation in the TDI plan will not affect your Social Security or Medicare benefits. Participation in the TDI Plan does not affect your retirement benefits from other retirement plans, including Tier One, Tier Two, and Tier Three participants of the Optional Retirement Plan and PERS/ OPSRP. These retirement plans calculate your benefits using your gross income, which includes your tax-deferred contributions to TDI investments. Your TDI participation does not limit your participation or deferrals to the voluntary Oregon Savings Growth Plan through PERS. Tax-deferred contributions to TDI investments that determine an ORP Tier 4 Employer Match Contribution are included in the TDI Annual Maximum Contribution. In all other respects, the effect on ORP or PERS/OPSRP Contributions in the same as for Tiers One, Two and Three. TDI participants may be eligible for a tax credit. The Saver’s Credit provides a tax credit for middle to low income participants using an employer’s retirement savings plan. This credit is in addition to the tax deferral advantage provided by the TDI Plan. The income limits are indexed for inflation. To see if you qualify for the credit, information is available through any tax counselor, your TDI investment provider, or the Internal Revenue Service. You can view a summary of the program here. Internal Revenue Code (IRC) places limits on the amount you may invest through the TDI plan on a tax-deferred basis. Maximum contribution limits are based on your includable compensation, which is your gross pay during a calendar year. A limit on your maximum elective contributions (general limit plus age 50 catch-up). A limit on the total contributions you may make annually to all 403(b) contracts you hold (402(g) limit). Participants are responsible for verifying their maximum permissible contributions annually. If the total you contribute in a tax year exceeds the limits contained in IRC 402(g) and other tax law related to this IRC 403(b) plan, you must include the excess in your gross income for that year for tax purposes. The maximum allowed elective contribution (salary reduction amount) is periodically adjusted for cost of living by the IRS, and you should check annually for the new limits that are generally announced in the last month of each calendar year. Individuals age 50 and older who already made the maximum allowable contribution under the general limit in the tax year may make an additional catch-up contribution. The maximum catch-up contribution is the lesser of the participant’s compensation, any other elective contributions for the year, or the general IRC 402(g) limit. The general limit applies to your total pre-tax and post-tax (Roth) voluntary contributions. If you request an additional age 50-plus catch-up, the additional contribution amount may be made on a combined pre- and post-tax (Roth) basis. This means that your pre-tax and Roth post-tax contributions, combined, may equal but may not exceed the general 402(g) and age 50 414(v) limits. Specific annual limits for both the general limit (IRC 402(g)) and the age 50 plus catch-up can be found in the TDI Plan Highlights available online here, or by contacting your institution’s benefits office. If you contribute any amount in excess of the described Internal Revenue Code limits, you are responsible for taxes and penalties on the excess amount. Oregon Public Universities Retirement Plans strongly suggest that you work with a tax consultant if you plan to maximize your contributions to the extent that they begin to approach any of the described limits. Effective September 1, 2011, Tier One and Tier Two members who are eligible to purchase service time can do so using dollars from the TDI 403(b) Plan. You do not need to be separated from service when your transfer is requested from your TDI Provider. You must purchase service credit within 90 days of your PERS retirement. Details on the transfer process can be obtained by contacting PERS or online here, and by contacting your TDI Provider. Post-tax “Roth” accounts are available through the TDI providers. Monthly contributions may be split between your pre-tax and Roth 403(b) accounts. Because each person’s situation in different and the rules are complex, you should talk to a tax advisor to determine if a pre-tax 403(b) or a Roth 403(b) account is best for you. Pre-tax 403(b) contributions go into your TDI account on a pre-tax basis. You do not pay state and federal income tax on that income when you earn it. Your W-2 does not include it. You do pay Social Security taxes on it. Imagine that you earn $30,000 a year, and you pay 5% of your wage, or $1,500 into the Plan. Your W-2 lists income of $28,500. You pay income tax on $28,500, if any tax is due. You pay Social Security tax on $30,000. The funds that you put in a Regular 403(b) account are invested and grow tax deferred. That means you do not pay tax as the funds grow. When you take funds out, you pay tax on them. Those funds may increase tax on Social Security benefits. How Does a Roth 403(b) Account Work? When you make Roth 403(b) contributions, that part of your income goes into the Roth 403(b) account on an after-tax basis. You pay state and federal income tax on income you contribute in the year that you earn it. Your W-2 includes it. You pay Social Security taxes on it. The income that you put in a Roth 403(b) account is invested and grows tax-free. You can take the earnings from your Roth 403(b) account tax-free when the distribution is “qualified.” To be qualified, the distribution must not occur until after expiration of a five-year “seasoning” period. The five-year period begins in the calendar year in which you first make a Roth 403(b) contribution, and ends at the end of the calendar year five years later. In addition, the distribution would become qualified after you reach age 59 ½ or die. A qualified distribution does not increase your taxes on Social Security benefits. For example, if you first make a Roth 403(b) contribution on October 31, 2007, your five-year seasoning period ends on December 31, 2011, and you can receive a qualified distribution from your Roth 403(b) account after that date. Your five-year clock starts running when you make your first Roth 403(b) contribution to the TDI Plan or to a Roth 403(b) account under any other employer’s 403(b) plan that you roll over into the TDI Plan. You do not need to make a Roth 403(b) contribution during the following years for the clock to continue. If a distribution from your Roth 403(b) account is not a qualified distribution, earnings from that account will be taxable to you upon distribution unless you roll over the distribution to a Roth IRA or another plan that will accept the rollover. In some cases, there is a 10% excise tax on the distributed earnings. Are Roth 403(b) Contributions in Addition to Regular 403(b) Contributions? No. You may not contribute more funds than the 403(b) deferral limits in a calendar year. Both Roth 403(b) contributions and pre-tax 403(b) contributions count against those limits. What are the Main Benefits of a Roth 403(b)? At retirement, if you have both a Roth 403(b) and a pre-tax 403(b) account, you may choose whether to withdraw tax-free funds from the Roth 403(b) account or taxable funds from the pre-tax 403(b) account. Whether you pay tax depends on many things, including the tax rates in any year. Putting money in a Regular 403(b) account may lower your taxable income now. That may allow you to use various state and federal tax deductions or credits to increase your tax refund. However, if you owe no tax now, or very little tax, Roth 403(b) contributions may be preferable. You pay low tax on the funds when you put the money in the Plan, and the money you withdraw from your Roth 403(b) account later is tax-free if the Roth is qualified. Those tax-free funds do not increase tax on any Social Security benefits you receive, so you keep more of those benefits. Finally, if you roll a Roth 403(b) account into a Roth IRA, you can avoid the age 70 ½ minimum distribution rules. You can keep the Roth IRA for heirs as an income-tax-free legacy if the five-year participation period is met. You do this by using the higher contribution limits of the Roth 403(b) while you are working, roll the account over to a Roth IRA when you retire, and let the balance grow tax-free until you die. If your spouse inherits the Roth IRA, your spouse can name heirs as beneficiaries and continue to let the money grow tax-free until your spouse dies. Thus, compounded tax-free growth could continue for a long time. You should seek estate tax advice to address estate tax concerns. Are Roth 403(b) Contributions Treated Differently than Pre-tax 403(b) Contributions? When you leave Oregon Public Universities’ employment, the money in your TDI account(s) can be handled in various ways. You may begin to receive annuity benefits or withdraw your account balance. A 10% penalty tax is applied to distributions taken before age 59 ½. If you separate from service at or after age 55, however, you may take a penalty-free distribution. You may leave funds in your account. You may roll TDI money into an IRA, or another 401(a) or 457 plan, subject to approval by those plans. If you become employed by another organization with a 403(b) plan, you may be able to rollover your money to that plan, subject to approval by the receiving plan(s). Your tax or financial advisor will be able to help you determine the best option for your personal circumstances. For information about rollovers to other plans, contact the receiving provider first to verify that a rollover will be accepted. Your Salary Reduction Agreement (SRA) may be changed at any time of the year. Just one TDI Provider at a time may receive contributions – split contributions are not permitted. Only one SRA may be in effect at any time, and the most recent SRA replaces all prior instructions to the plan sponsor. You may change your TDI Provider once each calendar year. Your Salary Reduction Agreement (SRA) may be changed at any time of the year. There are no open enrollment periods. No more than one SRA may be in effect at any one time, and the most recent SRA replaces all prior instructions to the plan sponsor. An ORP Tier Four Participant may change his/her TDI provider if a corresponding change is made to maintain the same provider for both plans. Contact the TDI Provider you wish to use in the future to request an enrollment kit, or to enroll online. Provider’s contact information is in the TDI Plan Highlights. Enroll online or complete an application to set up your account with the provider. Complete a new SRA to indicate your new TDI provider and the percent of pay you wish to invest. Keep a copy of the SRA for your records, and send the original to your campus benefits office. The name of the new TDI provider will be shown on your earnings statement in the month the change is effective. If you do not set up an account before the new TDI provider receives your payroll contribution, then your money will be invested in an age-appropriate lifecycle fund until you provide new investment directions through Fidelity Investments or TIAA. All Salary Reduction Agreement (SRA) forms must be received by your campus benefits office by the 10th of the month in which you wish to begin, change, or cancel participation in the plan. Forms received after the 10th of the month will be effective the following month. Check your earnings statement to verify when your changes have been completed. Your salary reduction amount can be designated only as a whole percentage of pay; for example, 4% of your monthly gross pay. The SRA form is available on the web, through the TDI provider’s dedicated websites, or from your campus benefits office. Read SRA instructions, examples and information available in Section 8 of this guide. Complete the SRA and keep a copy for your records. In months that you receive no pay, there is no contribution. When your pay increases through a job change or salary increase, your contribution increases proportionately, until you submit a new SRA. In a divorce your account may be subject to division through a legal document called a Qualified Domestic Relations Order (QDRO). A Qualified Domestic Relations Order is one of the few ways in which a retirement plan account may be distributed to anyone other than the plan participant. A domestic relations order is an Order signed by a judge relating to the provision of child support, alimony payments, or marital property rights made pursuant to state domestic relations law. Detailed procedures regarding divorce distributions can be found online here, or by contacting the Retirement Benefits Coordinator by emailing opurp@uoregon.edu. You may terminate participation in the TDI plan in any month. Termination does not mean withdrawal of funds, but stops your future contributions. If you stop participating in the TDI plan, you may begin again in any future month that you are eligible. Complete the SRA and enter 0 for your deferral percentage in section C.
Keep a copy of the SRA for your personal records. Send the signed, completed SRA to your campus benefits office. Loans are available in the TDI plans. A participant requesting a loan is required to disclose all other outstanding loans against retirement plan accounts held by the employer. This includes 403(b) accounts with discontinued providers that were established by November 2007, as well as any loans from the Optional Retirement 401(a) Plan, and PERS’ Oregon Savings Growth (IRC 457) Plan. Providers will provide loan terms and forms on your request, and will forward your loan request for approval by the plan sponsor. Generally, loans may not exceed $50,000 or 50% of your available account balance. The minimum loan amount is $1,000. Roth account assets are available for purposes of loans. As of September 1, 2016, participants are only allowed two outstanding loans at a time from the 403(b) TDI plans. Participants with two or more outstanding loans as of September 1, 2016 will be required to pay their outstanding loans in full until there is only one remaining before becoming eligible for another loan from either plan. Participants who default or have defaulted on a previous loan will be required to pay that loan in full and meet the other requirements before becoming eligible for a new loan. Example 1: A participant with two outstanding loans as of September 1, 2016, will be required to pay back one of their outstanding loans before they are eligible for another loan from the TDI. Example 2: A participant with one outstanding loan that has defaulted as of September 1, 2016 will be required to pay that loan in full before being eligible to take another loan, despite not meeting the two loan cap. Rollovers to the Oregon Savings Growth Plan (IRC 457 plan), the Optional Retirement Plan (IRC 401(a) plan), and qualified IRAs are permitted, subject to approval by the receiving plans. Rollovers from the TDI plan are permitted after severance of employment or attainment of age 59 ½.
Rollovers from qualified IRAs, 401(a), 403(b), and 457 plans to the TDI are permitted. Anyone with a TDI account, including Participants, their spouse beneficiaries, non-spouse beneficiaries and alternate payees may roll over funds to the TDI. This includes distributions from 403(b) and 457 plans, and qualified IRAs under Domestic Relations Orders (QDROs). Hardship withdrawals are permitted to meet an immediate and heavy financial need, if a distribution is necessary to satisfy the financial need. An IRS safe harbor list of specific needs and distribution criteria apply. Assets in a Roth account are not available for hardship withdrawal. Contact your provider for additional information, and a hardship withdrawal form. Your provider will forward your request to the plan sponsor for approval. Additional information on hardship procedures can be found online by viewing our plan document here. Annual distributions must begin April 1 of the calendar year following the year in which you achieve age 70 ½ or retire after age 70 ½. Penalties are applied if you do not begin your distribution according to these rules. Contact your provider for additional information. TDI Providers offer three different investments-plus-services to employees. Transfer of the participant’s account balance. These changes may be requested separately. Participants may select only one TDI Provider at any one time. “Lifecycle” target retirement date mutual funds designed for “hands off” investors. A core investment menu of mutual funds spanning a broad range of asset classes. A brokerage account for investors who want maximum flexibility and accept full personal responsibility for the performance and costs associated with a wide array of mutual funds available as an additional choice. A post-tax “Roth” account for tax-advantaged investment earnings. Fidelity Investments is one of the administrators for the TDI Plan, and has been a provider since 1992. As a record keeper to the TDI, Fidelity provides account administration, participant education, and retirement consultations. Fidelity offers investment management, retirement planning, brokerage services, and state-of-the-art technology services. Fidelity offers an advised core investment menu of mutual funds, including lifecycle funds, passively managed index funds, actively managed funds for each of the nine Morningstar asset classes, and VOYA fixed account. Investments on the core menu are monitored for performance and fees by an investment advisor and committee, and may be changed from time to time as needed to meet the investment policy of the plan. Each investment bears different expenses for not only investment management, but also recordkeeping and participant education and services. Participant education and advising is available online, by phone, or through individual meetings with retirement counselors. For more information about the TDI Plan accounts with Fidelity, you can call 1-800-343-0860 or visit www.netbenefits.com/opurp. See the TDI Plan Highlights at the end of this guide for more information about investments available through TDI: Fidelity. TIAA offers a selection of a guaranteed annuity (TIAA Traditional), variable annuities, and mutual funds. Before-tax and Roth accounts are available. TIAA has served the Tax-Deferred Investment 403(b) Plan since 1992. Investments and services are directly through TIAA. TIAA offers a combination of mutual funds, plus fixed and variable annuities. A short list of mutual funds supplements the CREF variable annuities, TIAA Traditional (fixed annuity), and TIAA Real Estate investment. The choice of mutual fund and annuity products allows a participant to diversify investments across a spectrum of investment performance and expenses. Participant education and advising is available online, by phone, or through individual meetings with retirement counselors. TIAA (Teachers Insurance and Annuity Association) is a leader in helping those in the academic, medical, cultural, government and research fields plan for and live in retirement. TIAA offers a wide range of products and services through non-commissioned consultants. TIAA offers fixed and variable annuities, including a guaranteed interest account, a real estate account, a socially responsible balanced account, four equity, and three fixed income accounts, as well as mutual funds representative of major asset classes including a suite of target retirement date lifecycle funds. For more information about TIAA, call 1-800-842-2776 or visit www.tiaa.org/opurp. See the TDI Plan Highlights at the end of this guide and “Investment Choices” on the first page of the TIAA Oregon Public Universities Retirement Plans website for more information about investments available through the TDI: TIAA program. VALIC offers variable and fixed annuity investments to participants who have been enrolled since October 10, 2007. Participant education and advising is available online, by phone, or through individual meetings with retirement counselors. VALIC comprises a national team of nearly 2,000 financial advisors and financial planners who, while offering a wide array of investment services, provide personal face-to-face service. VALIC offers more than 60 fixed and variable investment options managed by various well-known fund families. For more information about VALIC, call 1-800-448-2542 or visit www.VALIC.com. See the TDI Plan Highlights at the end of this guide for a sample of investments that are available through TDI: VALIC. The performance and goals of the investment products you initially select and your personal circumstances may change over time. When considering a vehicle for your retirement savings, think forward to the day you want to transfer or withdraw your investments. Ask questions about moving your money before you invest. Each Participant, Beneficiary, or Alternate Payee shall direct the investment of his or her account among the investment options available through his or her plan provider. Transfers among investments may be made to the extent allowed by each provider and as permitted under applicable Income Tax Regulations. Information about available investments, including investment performance, expenses, prospectuses and fund fact sheets can be obtained from the TDI Plan Providers. All movement of account balances are subject to change of investment rules of the IRS and the TDI plan. Transfer of full or partial account balances between TDI: Fidelity, TDI: TIAA, and TDI: VALIC may be requested once per calendar year. Current providers TIAA, Fidelity, and VALIC (provided that the account was established before 10/10/2007) may accept transferred account balances from any of the discontinued companies listed in the “Discontinued Providers” section of this document. There is no limit on the number of transfers for account consolidation from discontinued companies to the current providers. Accounts may not, however, be transferred to or among the discontinued companies. INQUIRE if there will be any restrictions or fees involved. Some providers charge fees when you transfer your account. There are no federal tax consequences to most transfers as long as your follow prescribed procedures. Check with both the “sending” and “receiving” provider about their procedures. In this matter, and any other matter relating to taxes, you should consult a tax advisor as well. Determine if all or only a portion of your account may be moved at one time. Some funds restrict transfers to a certain percent per year. Transfers to and from insurance and mutual fund companies outside the TDI plan may be made as eligible rollover distributions at separation from employment or other distribution event. Each provider has its own rules for exchanging money among different investment vehicles within its own investment menu. Sometimes fees are charged; for instance, as surrender charges when assets are withdrawn within a certain period of time. Exchanges may be restricted by frequent trading policies of the funds or provider. You can determine the exchange rules for each investment option before you invest in it by reading the provider’s materials or by asking the provider’s representative or customer services center. What is the procedure for exchanging money from one investment option to another? How often may I exchange among investment options? Do exchanges involve any fees? Are there limits on the amount I may exchange at one time? Carefully review the provider’s withdrawal provision before selecting your investments. Discuss the tax consequences of withdrawing funds with your tax advisor if you are unsure what effect a withdrawal would have on your tax status. Generally, withdrawals before age 59 ½ are assessed a 20% income tax withholding and a 10% early withdrawal penalty. Exceptions to the 10% penalty exist for withdrawals due to disability, medical expenses, alternate payees and beneficiaries, and retirement at age 55, among other reasons. Withdrawals from a Roth account may be subject to taxes on any earnings if the account is less than 5 years old. To ensure that your account would be distributed as you wish, contact your TDI provider to complete your beneficiary designation. You can view and update your beneficiaries online, in the personal profile section of your account. You may also request a beneficiary form by calling your TDI provider. Establishing your TDI account is part of a two-step process. Tell your campus benefits office to take a salary deduction by completing a Salary Reduction Agreement (SRA), which is available at https://www.opurp.org/plan-forms or at your institution’s benefits office. Apply for an account online through the website listed on the TDI Plan Highlights, or request an enrollment kit from your selected TDI Provider. If you participated in the TDI plan before November 2007, you may have assets in accounts held by insurance or mutual fund companies previously authorized to provide investments under the TDI plan. Those assets may remain in the account(s) you established previously. Your investments continue to participate in the earnings and losses of the funds you selected, and the terms of your annuity contract or custodial agreement apply. You may also roll those assets to the TDI plans at Fidelity and TIAA. Although no new contributions will be made to these companies by your employing institution(s), your relationship with them continues. Any account management questions should be referred to your prior company’s representative who is familiar with the terms of your individual contract. In addition, your prior company will be required to work with you and Oregon Public Universities Retirement Plans for approval of distributions, loans, or hardship distributions. Your contract’s compliance with federal treasury regulation, and your tax-advantaged savings, may be affected by your company’s active cooperation with Oregon Public Universities Retirement Plans and the TDI Plan. You and your company are responsible to confirm that your account remains in compliance with IRC 403(b). The following TDI companies received payroll contributions through October, 2007. After that date, no new contributions were sent to these providers, although participants’ account balances remain with them. Contact your Benefits Office for general information about the Tax-Deferred Investment 403(b) Plan and enrollment materials. See the WHAT’S NEW tab on the Oregon Public Universities Retirement Plans website (www.opurp.org) for announcements and news related to the Plan and providers/vendors serving the plan. In accordance with the Americans with Disabilities Act, if you need an accommodation to attend any employee meetings, or if you need to receive this booklet in an alternative form, please contact your campus benefits office.